Buy online AirGuard 3,650 sq. ft. 40 in. x 1096 ft. x 1/8 in. 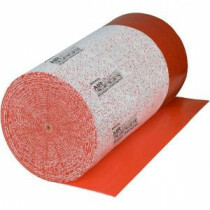 Value Mega-Roll of Premium 3-in-1 Underlayment with Microban 70-105-2 and leave review or share with Your friends. This is a volume value bulk buy of the Roberts 70-105 AirGuard Premium 3-in-1 Underlayment. The bulk roll has a 3 in. core for hanging on a pole in a contractor warehouse or service van and unrolling exactly what is needed for the specific installation. Roberts AirGuard Premium 3-in-1 Underlayment is ideal for installing laminate and engineered wood floors. AirGuard provides the moisture barrier, sound reduction and cushioning, all 3-in-1, required for a proper, quality installation. AirGuard is the only underlayment manufactured with both Microban and air flow technology to inhibit mold growth. Microban inhibits the growth of odor and stain causing bacteria, mold and mildew. The air flow technology creates a pocket of constantly circulating air to further inhibit mold growth. The 8 in. overlap film protects floors from moisture. Sound suppression characteristics make AirGuard perfect for installation in multi-level buildings. For more information, please refer to the product data sheet.